Introducing the world's first handheld GPS to combine navigational aids, satellite photography, and XM Weather on a single screen: the Onix 400. It shows you the perfect pinchpoint for this wind and how you should dress for the day. NEXRAD weather data downlinked via XM Weather, layered over a georeferenced satellite map of your location keeps you prepared. Introducing the world&apos;s first handheld GPS to combine navigational aids, satellite photography, and XM Weather on a single screen: the Onix 400. It shows you the perfect pinchpoint for this wind and how you should dress for the day. NEXRAD weather data downlinked via XM Weather, layered over a georeferenced satellite map of your location keeps you prepared. It&apos;s all housed in a rubberized defensive armor built to XPX7 waterproof standards, with a high gain SiRF GPS receiver. In your palm. The Onix 400 is the only GPS that lets you plot your course by comparing your surroundings with what&apos;s pictured in your palm. The ONIX 400 layers a satellite photo, topo map, compass and all navigational aids on a single screen. The menu function gives you easy access to all features of your unit in one simple screen. When you download a satellite photo to your Bushnell GPS, it&apos;s instantly georeferenced to the satellite network for navigation. This means the image is calibrated to adjust to your heading and location to display an accurate representation of the ground you&apos;re exploring. For example: if you&apos;re headed south facing a stand of pines, you can look down at your Bushnell GPS and the satallite image or aerial photo and directional compass will also display you&apos;re headed south and facing the stand of pines. This is called TruView navigation. By referencing the landmarks around you to those on your LCD, you can explore new territory with the competence of someone who&apos;s trekked the land for years. Unlike maps, which portray the landscape with generalized symbols and colors, satellite photography reflects the terrain as it exists in nature. Buildings, bridges, roads, urban and rural areas, and other manmade features are shown as they were at the time of photography. Georeferenced satellite images also give you an accurate portrayal of relative distance when viewing your position in relation to waypoints and visible landmarks. This means, if you know you&apos;ve traveled nearly a mile from your treestand, and your next stopping point appears to be of equal distance away on your LCD, you can estimate you&apos;re approximately a mile from your destination. It&apos;s fast, simple and the most efficient way to see the country. You can plan your adventure from your home computer: View the ground you&apos;ll be exploring, mark waypoints and plot your course. It will save you time in the field and give you an intimate knowledge of the land before you ever set foot on it. When you&apos;re on the move, you can reference the landmarks around you to what appears on your LCD screen. It&apos;s the easiest way to navigate, and no other GPS on the market gives you this capability. 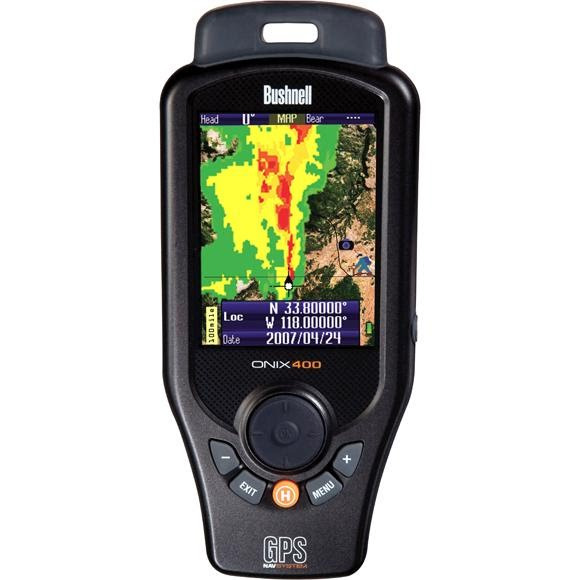 Bushnell&apos;s site is the only source for satellite photography for your Bushnell GPS. This ensures every image available for download is the highest quality and is compatible with your unit. No surprises. Just the most efficient handheld navigation system on the market - from the industry&apos;s leader in sports optics and outdoor technology, Bushnell. The Onix runs continuously for up to 25-30 hours on one set of batteries thanks to SafeTrack. This feature puts the display to sleep to save power while maintaining satellite connection behind the scenes. Optional audible alarms alert you of deviation from course. Wide Area Augmentation Systems. This is a network of satellites and ground stations providing GPS signal connections that enhance accuracy. Your Bushnell GPS has a WAAS-enabled receiver accurate to 3 meters 95% of the time. It&apos;s ultra-precise universal technology that&apos;s constantly improving. XM Satellite Radio Inc. is the nations leading satellite service provider with over 8 million subscribers for the home, car, aviation and marine. The XM system of redundant satellites, broadcasting in the S-Band, enables seamless delivery of audio entertainment and vital data services in the harshest of weather conditions. Starting in late 2003 with the XM WX Satellite Weather Service for aviation and marine markets and then following with the XM NavTraffic service in 2004, XM has demonstrated cutting-edge data capability that leverages the robust capability of the XM Satellite network. Pushing the envelope even further, XM is proud to announce the latest and most advanced service to date - XM Weather service.